I won’t need to do much explanation on one of the most breathtaking and the most advanced production Porsche currently. I meant to show this cast way earlier but things got in the way so it never made its spotlight which is perfectly fine as it turns out there’s not better time to show it than the event that celebrates the 70 years old pioneering car company from Stuttgart. I do however need to complement this HW redo of the cast. Its 100 times better than the previous concept version they released back in 2013. That casting was so out of proportion that it looks like it was crashed in a video game with unrealistic damage mechanics. 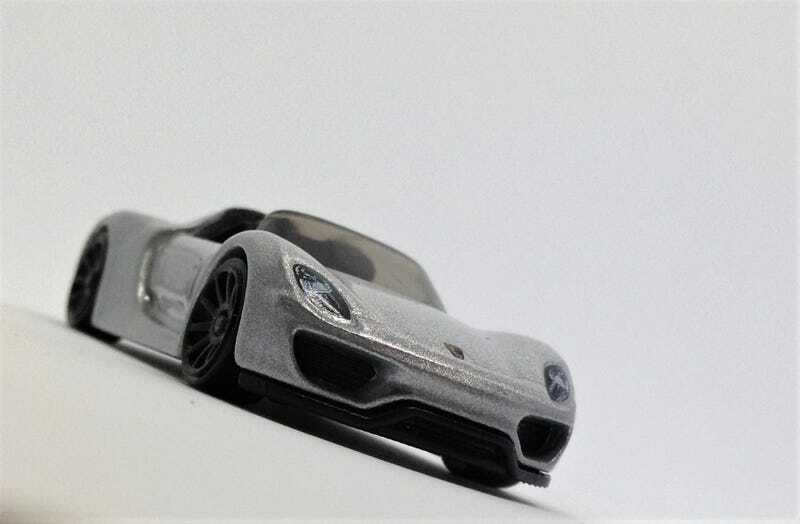 It came as a surprise when HW announced to do a re-tooling of the 918 and this time the production version, I was slightly worried about them repeating the same mistake until the first images of the final product dropped and its absolutely perfect. Gone are the terrible proportion, its now low and sleek like how it should be and and ride height seems to improved too. Key tampos are mostly present apart from the taillights which I did the honor as its a tight spot to stamp tampos that was tucked below the spoiler. The black 10 spoke works great giving it the Weissach Package look plus during development there were sightings of Porsche 918 prototypes with 10 spokes. I wonder why they never offered them. To complement this great redo, I colored the spoiler black to make this a semi-Weissach Package 918 with the wheels and spoiler but without the rear fins. Finally, a Porsche 918 I’m proud to have.